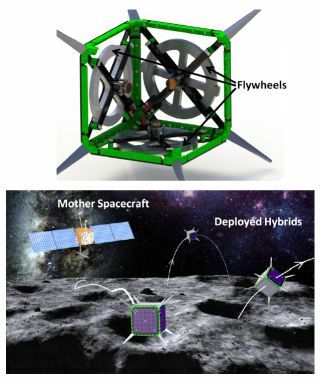 A proposed hybrid spacecraft/rover system designed to help explore small solar system bodies such as asteroids was chosen to receive a Phase 2 grant from the NASA Innovative Advanced Concepts program in 2014. NASA has selected its latest batch of high-tech ideas for the future of space exploration, with the agency funding more research into five bold concepts that range from an innovative asteroid-mapper to a colossal "orbiting rainbow" that could see objects in ultradeep space. All five technology concepts had previously received funding through the NASA Innovative Advanced Concepts program, or NIAC. Those earlier Phase 1 awards granted each concept team roughly $100,000 for up to a year to allow an initial analysis. Now, the five space tech concepts have made it to Phase 2, which provides funding of up to $500,000 apiece for additional development work over the next two years. "Technology drives our futures in exploration, science and commercial space, and investments in these advanced concepts must be made to ensure we will have the spectrum of capabilities for the near term and well into the 21st century," Michael Gazarik, associate administrator for the Space Technology Mission Directorate at NASA headquarters, said in a statement released on Wednesday (Aug. 6). Orbiting Rainbows Phase II: This technology would image faraway objects with high resolution by using orbiting clouds of dust as an enormous photographic aperture. The proposal is led by Marco Quadrelli of NASA's Jet Propulsion Laboratory. Spacecraft/Rover Hybrids for the Exploration of Small Solar System Bodies: This idea would send tiny spacecraft out from a mothership onto the surface of a low-gravity target, such as a small moon or asteroid. The probes would be somewhere between 1 centimeter to 1 meter (0.4 inches to 3 feet) in size and use flywheels to hop or tumble across their target's surface. The project is headed by Marco Pavone of Stanford University. 10-meter Suborbital Large Balloon Reflector: This idea would turn a big, inflatable reflector into a balloon-borne telescope capable of making observations from the stratosphere. The PI is Christopher Walker of the University of Arizona. Low-Mass Planar Photonic Imaging Sensor: This proposal aims to develop innovative new sensor technology that could make the telescopes on interplanetary spacecraft lighter and cheaper. It's led by S.J. Ben Yoo of the University of California, Davis. "These concepts, anchored to sound science, but rich in 'what if' creativity, will make our science, exploration and commercial space futures possible," Gazarik added. Most of these ideas are at least a decade away from being implemented on a NASA mission, but they all show great promise, NASA officials said.